The question was asked by one of my boys as we sat around the dining room table. 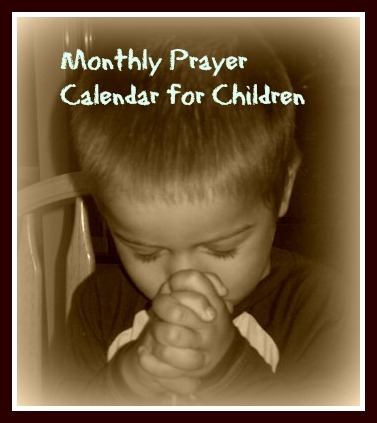 That conversation is one of the reasons why I love using the monthly prayer calendars with my children. The ideas for prayer make us think beyond our own individual needs and into the greater community — and even out into the world. I don’t know the impact the prayers of my children are having — perhaps I never will — but I DO know that prayer is a powerful tool and when our children learn to pray BIG and CREATIVE prayers, amazing things can happen. THAT is something I want to be a part of. 1 El Olam – the Everlasting God. Praise God that He is eternal! 2 Pray for God’s will to be done on the mission field in the United States. 3 Pray for the members of your local government to seek God’s will. 4 Pray for your cousins. 5 Ask God to help you say “I’m sorry” when you need to. 6 Pray for the temptation to think bad thoughts. 7 Make Valentine Cards to show the love of Jesus to others. 8 Jehovah Tsidkenu – The Lord our Righteousness. 9 Pray for God’s will to be done on the mission field in Mexico. 10 Pray for politicians to put God’s desires ahead of their own! 11 Pray for your best friend and his family. 12 Pray for your family to always forgive those who hurt them. 13 Pray for the temptation to waste time. 14 Deliver Valentine Cards and flowers to a local nursing home. 15 Jehovah Nissi – Praise God that He is victorious! 16 Pray for the children of the world to find Jesus! 17 Pray for the financial needs of your local church body. 18 Pray for your Sunday School teacher. 19 Pray for people who need Jesus to be willing to ask for forgiveness. 20 Pray for the temptation to think of yourself too highly. 21 Invite a neighbor to church with you. 22 El Roi – Praise God that He sees us! 23 Pray for God to give you an opportunity to be a missionary today! 24 Pray for college students to come to know Jesus! 25 Pray for your future husband or wife! 26 Pray for the forgiveness of your nation. 27 Pray for the temptation to have a bad attitude. 28 Check back on your spiritual goals for 2015. How are you doing? Saturday: Suggested activity to end the week. Don’t forget, the Easter Bible Reading Plan begins on February 17! Be sure to check those out under “Bible Reading Plans” and join us for a wonderful Easter season! Also, if you want even MORE, check out ‘The Feast, a 7-week Easter study for families’. This is a book that is filled with ideas for Bible reading, as well as ideas for using the Scripture lessons across the curriculum. Click on the picture for more information. And, if you have a pre-teen who would benefit from his own devotional, be sure to take a look at “My Brother’s Feet Smell as Bad as Noah’s Ark: (and 30 other devotions that stink).” This is a fun devotional that will challenge your child to take his faith seriously. Click on the picture for more information. I hope you have a fantastic February. Keep on praying!